Today, I'm reviewing Lust for Life (1956) starring Kirk Douglas as painter Vincent van Gogh. 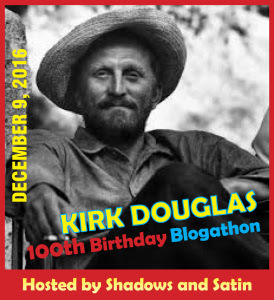 This article is part of the Kirk Douglas 100th Birthday Blogathon hosted by Shadows and Satin. 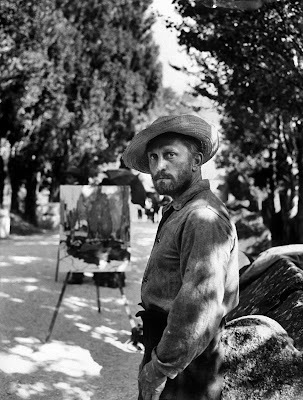 Rarely has an actor been more right for a role than Kirk Douglas was for Vincent van Gogh in Lust for Life (1956). Not only does Douglas strikingly resemble the tortured artist, but he uses his trademark intensity to portray a man whose revolutionary paintings were ahead of his time. Lust for Life begins when van Gogh is an unsuccessful minister in a small coal-mining town in Belgium. After his denomination removes him from the post, he takes up art to ease his mind with the encouragement of his devoted brother, Theo (James Donald). He starts out painting working-class people in his native Holland, but after moving to Paris and then Southern France, he begins his revolutionary experiments with light and color that led to his greatest masterpieces. Lust for Life is based on Irving Stone's 1934 novel (Stone was old Hollywood's go-to historical fiction author. In addition to this movie, there were screen versions of The President's Lady (1953) about Andrew Jackson's wife, Rachel, and The Agony and the Ecstasy (1966) about the Sistine Chapel). MGM bought the rights in 1946 for a planned screen version starring Spencer Tracy, but the studio eventually decided that van Gogh's downbeat life story lacked box-office appeal, and they shelved the idea. Lust for Life had a couple of false starts during the early 1950s. Both Van Heflin and Yul Brynner were slated to star in the movie at one time or another, but the project finally got off the ground when a traveling exhibit of van Gogh's paintings became a media sensation and drew hundreds of thousands of people to museums across the country. The potential for big box-office receipts finally got MGM chief Dore Schary to greenlight the project with Vincente Minnelli as the director and Douglas as the star. The result was a critical and popular hit that proved to be a landmark film in Douglas' career. He had previously been known for playing tough guys in noir and action-adventure heroes, but his groundbreaking performance as Van Gogh led to meatier parts in movies like Paths of Glory (1957) and Spartacus (1960). Douglas won the Golden Globe and New York Film Critics Circle Award for best actor, and he was also nominated for an Academy Award for best actor. He lost to Brynner in The King and I (1956), but Anthony Quinn did nab a best supporting actor nod for his larger than life portrayal of van Gogh's friend, artist Paul Gauguin. Viewed today, Lust for Life is a very entertaining biopic that remains one of old Hollywood's great artistic achievements. Much of the movie was shot in European locations where van Gogh lived and worked, and Minnelli, cinematographer Russell Harlan, and art director Cedric Gibbons meticulously arranged each shot to reflect the artist's life and career. The early scenes in the film are shrouded in the muted blues, browns, and grays of van Gogh's early paintings, but, once Vincent arrives in sunny Arles in Provence, the film becomes a rich riot of bright yellows, oranges, and reds. 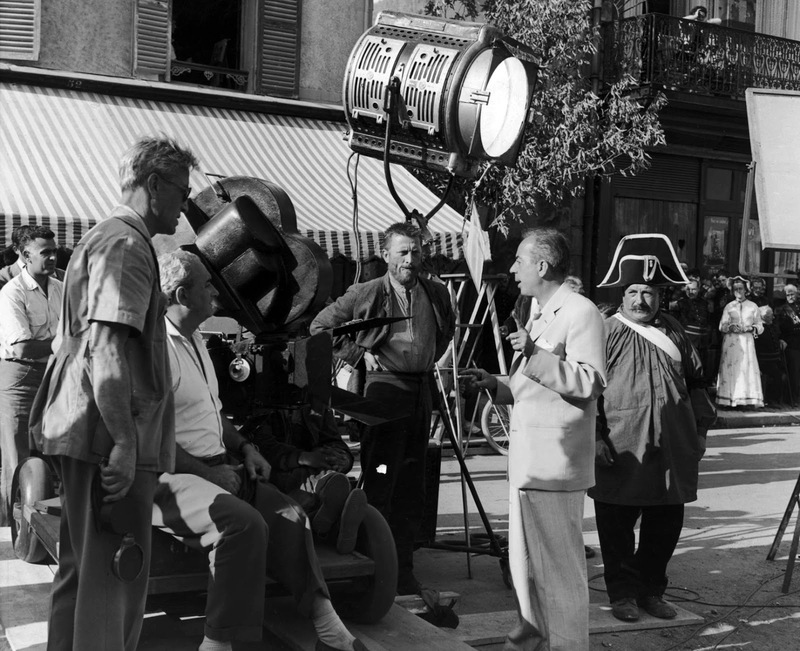 Kirk Douglas and director Vincente Minnelli (center in white) filming Lust for Life (1956) in Arles, France. 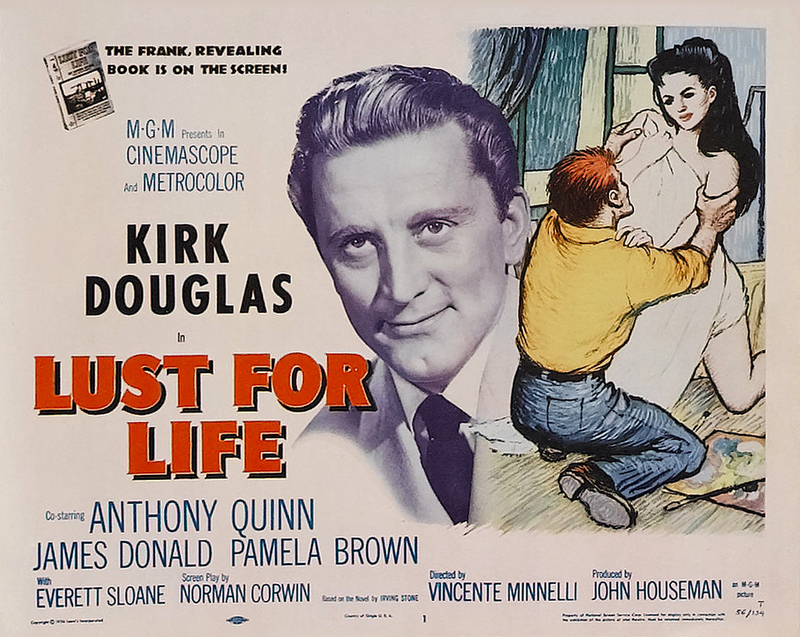 As wonderful as Minnelli's accomplishments are, Lust for Life would not have succeeded without Douglas' dynamic performance as van Gogh. The actor, who turns 100 years old on Dec. 9, is known for bringing a passion and intensity to his roles, and those characteristics, plus the fact that the bearded Douglas strikingly resembles van Gogh's self portraits, makes this one of the great acting achievements in old Hollywood (although Brynner is great in The King and I, Douglas should have won the Oscar for this performance). More importantly, Douglas conveys van Gogh as a visionary artist who was misunderstood in his own lifetime. It's fairly certain that the painter had an undiagnosed mental illness, but he was also suffering from having his great talent dismissed by other artists, his friends, and his own family. Even the devoted Theo can't fully comprehend his brother's genius -- at one point he urges him to create more conventional paintings that will appeal to middle-class buyers -- which leaves Vincent increasingly isolated. He is left alone with his artistic vision until even that becomes too much for the sensitive young man to bear. I'll leave you with a wonderful scene between Vincent and Theo. Happy 100th birthday to Mr. Douglas and here's to many more. Lust for Life will air at 1:30 a.m. Feb. 15 on TCM. It is available for streaming on Filmstruck and DirecTV. Also on DVD, Blu-ray, and video on demand. The stars aligned for this film. Hi. Just wanted to see how different your take on this movie was from mine. I could see Helfin as VVG but not Tracy or Brynner. Minnelli was the right director though. Beautiful cinematography and a great performance from Kirk. Agree. Heflin could have been decent in the part. He was a fine actor. Like Denzel Washington with Malcolm X or Daniel Day-Lewis with Abraham Lincoln, Douglas simply is Van Gogh. When I watch the film I don't see an actor, but the artist being brought back to life-- he should've gotten the Oscar like his buddy Anthony Quinn. Although Yul Brynner was born to play the King of Siam, Douglas put his blood, sweat, and tears into playing Van Gogh. He really should have gotten an Oscar for it.